On the battlefield, an Aztec warrior would rely on his weapons. 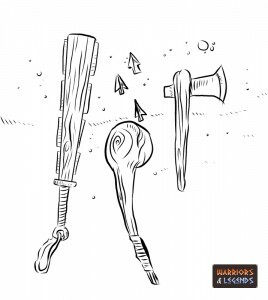 A mix of ranged and melee weapons, the Aztec warrior had a plentiful supply of weaponry choices with which to pommel, rain down on, strike, cut and generally inflict damage on any foe. If the battle started from a distance, the Aztec warrior could utilize his ranged weaponry, and should the need arise and the battle lines close, then close quarter melee weapons would be employed. In ancient mesoamerica, in the time of the Aztecs, the choice of weaponry was limited by the materials available. Metal, in particular iron was not available, and the remaining choices of gold, silver and copper were not ideally suitable to weapon fabrication. Therefore the Aztec warriors would step onto the battlefield utilizing the materials available at the time, wood and stone. This limitation of materials and the inventive and artistic nature of the Aztec people created some of the most visually interested weapons to date, the Maquahuitl with its wooden handle and obsidian blades is not only striking to behold but deadly as well. Other bladed weapons were constructed using obsidian too, like the spear tips and arrow heads. Blunt force weapons were popular too with a range of clubs and maces, made from local wood and all capable of life ending blows. Always the creatives, the Aztecs created a huge range of weaponry for their warriors to choose from. There is a plentiful supply of ranged and projectile weapons and a vast array of melee weapon choices. A selection of Aztec weapons, a Macuahuitl, a Cuauhololli, and a Itztopilli. Ranged weapons were common for the Aztecs, they allowed them to engage in combat from a safe distance, and while their ranged weapons were not the most advanced for the time, they were more than capable of working in ancient Mesoamerica. The atlatl was an inventive little tool, that basically was a spear or javelin launcher. The atlatl was an extension of the Aztecs arm, allowing more leverage when throwing a spear. the atlatl was basically a shaft with a cup holder at one end, that allowed the spear shaft to rest in it. This would extend the length of the arm and allow the user to propel the spear or dart much further than normal. The darts or spears the Aztec warriors used with the atlatl well called Tlacochtli, and were under 6ft in length. The leverage the Atlatl added to a throwers ability allowed the Aztecs to launch these darts over great distances. The Tlahhuitolli was the Aztecs bow, made from a flexible wood native to Mexico, which the Aztecs would have had local access too. Around 5 foot tall, or around 165cm the Tlahhuitolli would have allowed the Aztec archers to rain obsidian or animal bone headed arrows down on the enemy form a distance. The Micomitl was the accompanying quiver the Aztec warriors used, they would have carried enough arrows known as Yaomitl with them to ensure they could weaken the enemy before closing ground. The Tematlatl is a sling used by the Aztec warriors to rain down a hail of stones and rocks on their foes from mid to long range. This sling was made from the leaf of a Furcraea plant native to warm rainy climates like the gulf of Mexico. The Tlacalhuazcuahuitl was a blowgun used by the Aztec warriors. Constructed from a reed, the Tlacalhuazcuahuitl blowgun fired wooden darts that the Aztecs would apparently lace with dangerous toxins from poisonous frogs from the local jungles. It’s thought this ancient Aztec blowgun was used primarily for hunting, but would have been useful in stealth attacks and raids. The Aztecs in battle when necessary would close the ground between them and their foe. One within melee combat range, the Aztec warriors had a diverse range of combat weapons to choose from, bladed wooden swords, club and batons and even spears to keep the enemy at bay even when up close. The Aztec Macuahuitl is one of the most iconic Aztec weapons. It’s often called the Tezcatlipoca after the god with the same name, and is a wooden sword lined with obsidian blades, used to cut, slice and generally damage the opponent. The Macuahuitl commonly had a wooden loop at the base of the handle and the Aztec warriors would use a piece of fabric to fasten their weapon to their wrist or arm. There was also a longer version of the Macuahuitl designed that was up to five feet long, this super size version required two hands to wield. The Cuahuitl was a wooden baton used in battle to club and inflict blunt force trauma, and the Cuahuitl was fashioned from one solid piece of wood. The Tepoztopilli was a one piece wooden spear with obsidian blades on the edges of the spear head. Typically the tepoztopilli was five to six feet long, roughly around two metres, and its sharp blades would have caused plenty of damage in battle. The Cuauhololli mace was a fearsome weapon, a one piece wooden club that was topped with a rounded head used to bash and bludgeon the Aztec’s enemies. Its thought that the Aztecs did use axes later in their lifetime, although they were considered far from common place. Axe heads would have been made from stone or copper and lodged into a wooden handle. The Tecpatl was an Aztec dagger made from obsidian, and was a common bladed weapon typically used in sacrifices, and likely wouldn’t have been carried on the battlefield. The Aztec warriors as we can see, had seemingly a weapon for every occasion. They were more than capable of peppering the enemy with obsidian or bone headed arrow from a distance. They would employ slings and light projectiles at mid range, and when closing the distance, they would attack with spears, clubs and their trusty Macuahuitls.